As food is ground up by the teeth, it also undergoes a special chemical attack, carried out by the saliva. People are seldom much aware of this fluid in their daily lives, and people do not generally consider whether or not it is secreted, nor in what quantities. Saliva is believed to be a very simple fluid, when in fact it is a most special compound, containing specific levels of various chemicals. First of all, saliva permits you to taste your food. The flavor-giving molecules in food dissolve in saliva and combine with the taste-receptor nerve endings on your tongue. Only in this way can you actually taste what you are eating. That's also the reason why you cannot taste food when your mouth is dry. Saliva is secreted by three different glands, and makes it easier to swallow food by moistening it, as well as containing chemical substances that dissolve what we eat into particles of benefit to the body. In the saliva itself are two different fluids with very different properties. One thoroughly breaks down carbohydrates and turns them partially into sugar. For example, if you place a piece of bread in your mouth and wait for a minute, you will taste the sugar of the broken down carbohydrate. The other saliva fluid is very dense. Thanks to this liquid's stickiness, the particles of food that spread around the mouth as we chew are brought together in a kind of paste. If saliva were not secreted, our food would be too dry for us to swallow, and we could neither swallow it, nor speak properly. We would be unable to consume any solids, and would have to feed ourselves solely on liquids which would make life rather difficult. The digestion taking place in the mouth is not only chemical. Mechanical digestion is also performed by the teeth. These two forms of digestion complement each other.In mechanical digestion, the tongue plays an important role. It possesses a very sensitive sense of taste, and also directs food in the mouth, enabling it to be chewed and swallowed easily. On the surface and sides of the tongue are some 10,000 or so taste buds, which are sensitive to four different tastes: hot, sweet, salty and bitter. These taste buds allow you to distinguish the flavors of the dozens of different foods you consume every day. They work so well that the tongue can also distinguish the tastes of foods it has never encountered before. That is why a watermelon never tastes bitter to us in the way a grapefruit does, and why a piece of cake never tastes salty. In addition, the taste buds in billions of different people perceive the flavors of food in exactly the same way. The concepts of sweet, salty and bitter are the same for everyone. 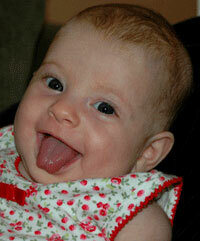 Scientists describe the tongue's ability as "extraordinary chemical technology."